Home / News / How do you solve a problem like Primark? How do you solve a problem like Primark? I’ve previously addressed the issues around ethical fashion practices, branding and accessibility to the consumer. This past week, high street retailer Primark has yet again been in the firing line for its manufacturing practices abroad. Two of their consumers found ‘ cry for help’ messages stitched in the labeling of garments they had purchased at the store, claims which were investigated by the retailer and found to be hoaxes conducted by possible activists, here in the UK. 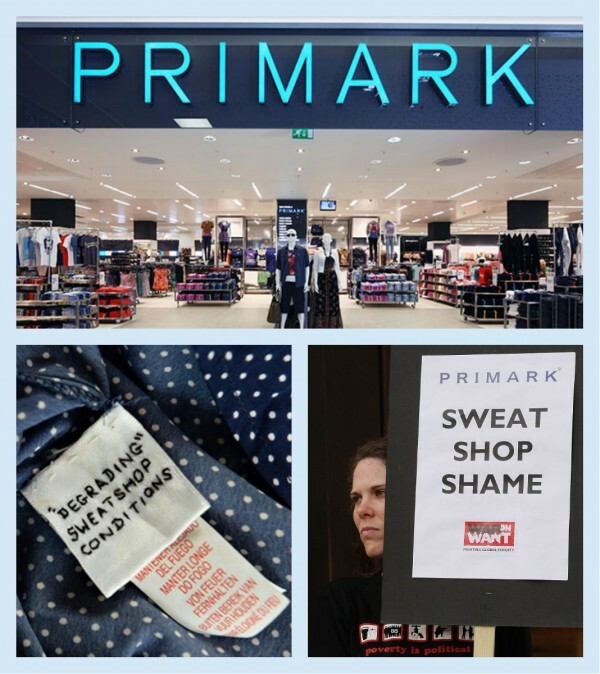 It is slightly unfair to scapegoat Primark for these despicable practices as they are not the only retailers on the high-street using these sweatshops, but they have none the less been made the poster child of the anti sweatshop propaganda. So what can they and other retailers do to reverse the wheel of bad publicity they have received these last few years? According to they’re website, they have become more ethically minded and insist that sustainability is at the heart of what they do. I think that’s a tad disingenuous when you consider the bad quality of the garments and the quantity in which they produce this throwaway fashion; practices which are the polar opposite of sustainable. But is Primark the real problem here? Why aren’t we the consumer more aware of ethical fashion when there have been countless campaigns about it and even TV programs on sweatshop horrors? Or is it that we just don’t care? I honestly think it may be the latter. The real question I’d like to ask is do sustainable designers need to rebrand themselves? Yes it is important for consumers to know about your ethical and sustainable practices as a brand, but is it wise to ram it down their throat? I’m not so sure. Designers need to ask themselves, what do consumers really look for in fashion? The truth is that they look for aesthetics in the clothes and fair pricing. Designers probably need to look to sell themselves as designers primarily and drop the ethics USP because the consumer evidently doesn’t care enough to stop buying cheap fashion. I’m sure the sentiment of sustainable practice in fashion is shared and is one the consumer wants to adhere to but illogically they want great fashion and at low prices. Having said that, there are plenty of consumers who are willing to paying extra for quality and great design; herein lies your market. So should the ethical designers ignore the ‘Primarni’ lovers and go for the Reiss end of the market? British designers will have you believe that British made eco fashion is the most ethical way to shop and that is true. Kitty Ferreira is a prime example of a brand that uses ethical practices by manufacturing and sourcing in the UK, which in turn, contributes to the UK job market and the economy by keeping the supply chain within mainland, producing luxury garments that will last for years to come. They also eco dye with natural materials ( pomegranate and onion skins) and use upcycled fabrics. Quantities are small and they don’t bang out a new collection every season. We all know that buying quality will last but the consumer doesn’t hear any of that, so how do ethical designers convince the consumer to change a lifetime of buying habits? Ethical Fashion is benevolent at best but consumers are only interested in being fashionable and on trend, qualities that portray vanity, selfishness and self-absorption, nothing to do with ethics. So why brand yourself as an ‘Sustainable Designer’? When consumers look for their next outfit on the high street they don’t look for sustainable and ethical designers and they don’t Google such designer when they shop online. They don’t see ethical fashion because they don’t look for it and that is the bottom line. So it seems like an obsolete way to promote yourself. Putting aside accessibility and pricing, the main other issue that ethical designers face is following fashion trends and producing great designs. Fashion trends are what drive the fashion industry; just ask the fashion bloggers they are the taste-makers. A lot of ethical designers struggle with this, particularly the ones at the more affordable end of the scale. The designers that I’ve found tend to produce classic and simple, well made designs which are fine if they look to appeal to a niche market but if designers want global success then they might want to consider taking a bolder approach to their designs. Kitty Ferreira produces classic designs with bold colors, which can be worn with trendier garments. So classic can work but it has to have a bolder angle. To paint all ethical and sustainable designers with that same brush would be unfair as there are some that do produce great designs. Ada Zanditon and Edun being some of them. But the problem with those great designers is their affordability. Most people can’t fork out £1000 on a great jacket designed ethically. The bottom line is consumers do follow trends and want it cheap, so retailers comply and designers that don’t probably would find it difficult getting their designs in those high-street stores and online retailers. The online market is fine but pointless if no one is looking for you, so maybe it’s time to try other marketing tactics. Pointing the finger at retailers and consumers isn’t enough to solve ethical issues in the industry, maybe ethical designers need to re-examine whether they are doing enough to appeal to masses. It might be an obvious thing to point out but if designers can combine visibility, affordability and design aesthetics then they will have a winning formula in their hands.